As Apple kills off the optical drive in its new MacBook Pro and MacBook Air to maintain super-thin profiles, users are left with no ways to play/rip DVDs on Mac directly. For example, you're not allowed to play DVD venom on Mac unless you turn to an external DVD drive or make a digital copy of Venom. Though the remove of DVD drive for Mac doesn't mean blocked access to DVD discs on Mac. 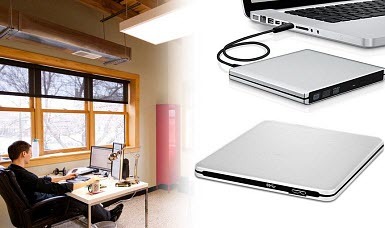 To survive with Mac computers without built-in optical drive, there are workarounds available, among which the external DVD drive for Mac maybe the easiest. How to Play DVD on MacBook Pro/Air without Drive? Turning thousands of discs into handy digital formats- convert any DVD discs into MP4, MOV, AVI, M4V, 3GP, MKV etc with world's No.1 speed. Remove all the DVD protections and support any disc formats. Apple's USB SuperDrive is the Mac external hard drive designed to complement MacBook Pro/Air. It is compatible with Macbook ,Macbook air, Macbook Pro, iMac or Mac mini via a single USB cable to help read DVD/CD and write to CD-R and DVD-R discs. 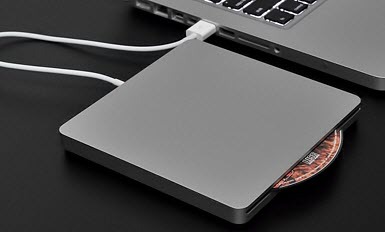 With this portable disc drive for Mac, you can play DVDs, rip discs, burn home movies to DVD, extract music from CD etc. The external ODD has 8x faster DVD writing speed. 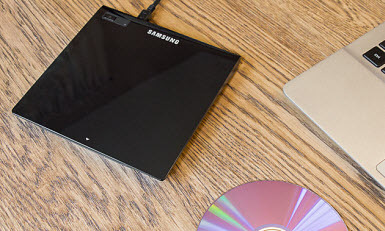 Samsung's ODD has a ultra thin design advertised as the thinnest external optical drive for Mac. It's fully compatible with Windows and macOS, and even Chrome OS and Android. It's able to read and burn various DVD and CD formats, with the writing speeds claimed to range from 6x for dual-layer DVDs to 24x for CD-RWs. A big plus is the USB2.0 and USB 3.0 compatibility, while no Blu-ray support is a major disadvantage. Anyway, it's one of best external DVD drive for Mac picked for DVDs. LG is the best Mac portable DVD drive that's alternative to Apple USB SuperDrive but at a lower price. It can read and burn DVD and CD on Mac and PC, also delivering 8x max DVD writing speed. This external disc drive for Mac has two distinct features: first, it support M-Disc which will protect the data and make it exist longer than standard DVDs; second, it adopts Silent Play technology that can make the DVD playback process less noise than other external Mac ODDs. This ODD is especially designed to play CD/DVD and burn CD (only CD supported) on MacBook, Macbook Pro, Macbook Air, other ultrabook, PC, laptop via USB. The external optical drive for Mac has superfast speed to read and write disc, ranging from 5x for DVD-Ram to 24x for CD-RW. However, there are some design flaws, for example, the lack of an eject button makes it inconvenient to remove the disc if it gets jammed. 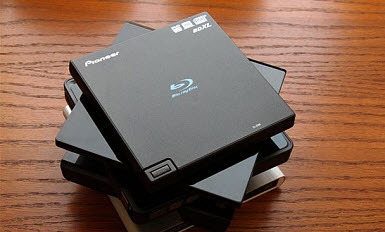 The above options are best external hard drive for macOS, if you handle with Blu-ray discs a lot, Pioneer is a good choice. As the external BD drive for Mac, Windows and Linux, it accepts BDXL, Blu-ray, DVD, and CD media with speeds up to 6x DVD disc burning and ripping. The Blu-ray ripping is slower with some noise. It price is much higher than other DVD drive for Mac, but it's quite affordable compared with other BD drive competitors. External disc drive for Mac is convenient as it provides direct access to discs. But it's less handy when users need to play a disc on the road. If you want to play DVD movies on a MacBook Pro, you will need an external DVD/CD drive for Mac, an USB cable, and the disc. That's too much trouble. 4. excellent quality reserved; 5. it works on macOS High Sierra/Sierra and earlier systems. Step 1: Free download the DVD ripper on Mac. Insert DVD into the external disc drive for Mac or another computer that has an optical drive built-in. Step 2: Choose output format from the drop-down profile window. To play DVD disc on Mac, MP4 or MOV are both good formats as they're compatible with Mac default QT player or other programs. After a few minutes, the DVD movie will be saved in your computer and then you can watch those movies without taking an external DVD drive for Mac computers every time. 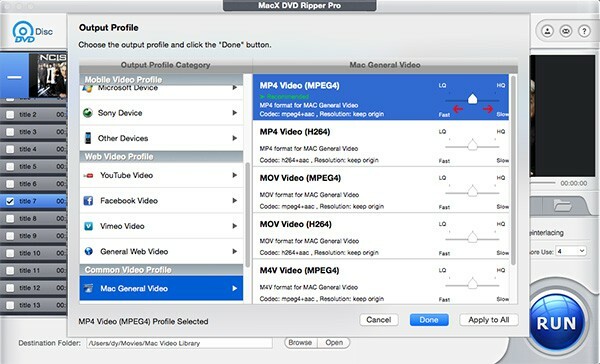 MacX DVD Ripper Pro allows you to rip any DVD to MKV, MP4, MOV, AVI, FLV, WMV and more to MacBook Pro, MacBook Air/iMac without DVD drive. No.1 fast speed and original quality reserved. You can play discs without carrying an Mac external disc drive.